What comes to your mind when you think of Easter? Well, I have a lot of memories of Easter with family members when I was a young child. I have even more memories of Easter with Gracie. I always try to incorporate the Skimahorn’s (my maiden name- please don’t make fun of me) family traditions into our family. I’ll talk just a little bit about our Easter traditions in this post and YOU will have a chance to win an Easter Family Picnic Set. 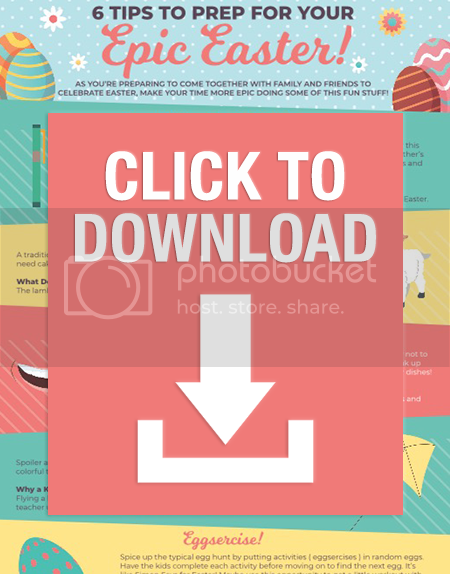 Hopefully, you can include this into your future Easter traditions! When I married Gracie’s Dad, for the longest time we didn’t have children. It was eight years before Gracie came along. When she did, I was so extremely thrilled. There was no longer the huge family to hunt Easter eggs with, but we always did an awesome egg hunt at the house. Ours did not compare to the wonderful egg hunt that our Church put together for the community for years, so Gracie always attended our Church hunts. I would love to know how you and your family celebrate Easter. Do you have any special traditions? Do one of your kids freak out at the large Easter bunny for the picture? Let us know all about it! You have questions about the Catholic faith and what it means to be Catholic. We have answers. Using a team of witty writers, appealing hosts, and even some learned theologians, we’ve created shareable, snackable videos that teach the timeless truths and deep history of the Church with humor and heart. Produced in the Family Theater Productions studios on Sunset Boulevard in Hollywood, CATHOLIC CENTRAL entertains, enlightens and inspires. You can also check Catholic Central’s Youtube. Ok, now for the giveaway~ You can win the exact Easter Picnic Basket that I received (pictured above). It is open to the US only and no POB’s please. It is a rafflecopter giveaway so please give the form time to load. This giveaway ends 4-26 and the winner has 48 hours to respond to the winning e-mail or I will have to choose a new winner. You may only win this specific prize once, please give everyone a chance to win. The Egg Peel-a-Thon ( the part with gloves on )! The cake and the kite were the best tips! My favorite is the Lamb cake and also flying a kite. the flying a kite part! beautiful basket and a easter picnic sounds perfect! I found the kite flying interesting.
? ?Flying kites have always been a favorite Passover celebration pass time activity for our family. Every year we each got a new one.? When I was a kid our Easter basket always had a kite in it. I love egg hunts. Do them every year for the kids, so much fun! Reminding me how fun flying a kite can be. We love to participate in egg hunts! I haven’t done any kite flying in forever. Maybe I’ll grab one for the grands for Easter. I also find the public egg hunts to be too aggressive. Especially for the small ones. We egg hunt at home. The lamb cake was my favorite so pretty. We always fly a kite~ Sometimes works sometimes not so much! I love the idea of decorating each other’s head as you would Easter eggs. That’s a creative twist to Easter fun! Flying a kite. An egg hunt. Wonderful Church experience. All good ideas for the perfect Easter. I like the Eggsercise tip. I liked the tip to fly a kite! We love kite flying at the beach, but I’ve never heard of it around Easter! The Lamb of God, Jesus and Cake! The lamb cake should be nice. I’ve made a bunny before, but never a lamb. I found the litter “eggercise”‘s the most interesting for kids to follow! I thought Why a Kite was most interesting. I plan on baking a lamb cake this year. I like the eggsercise tip. Something I need to do more often. I like the idea to bake a lamb cake. My daughter would enjoy that. The part about flying a kite was really interesting.